While Nebraska is rarely thought of as a prime state to chase big elk in – nearby Colorado leads the pack with more than 250,000 elk while Arizona, Montana, Nevada, Utah and Wyoming often lead the way for huge trophy bulls – the Cornhusker State is actually a surprisingly good place to chase wapiti. Naturally finding their way back into the state in the 1960s from nearby South Dakota and Wyoming herds, the first modern elk season was held in Nebraska in 1986 according to a variety of published reports. One of those, an online report written by outdoor writer Larry Porter earlier this year in the Omaha World-Herald newspaper, shows that Nebraska is home to only around 3,000 elk that reside in seven elk hunting units across the western reaches of the state. Since the first Cornhusker State elk season in the mid-1980s, Porter reports state officials have issued a reported total of 3,946 permits that have resulted in hunters taking 2,020 elk including 998 bulls. Tags come via a once-in-a-lifetime draw for Nebraska residents where hunters apply early each summer, accrue preference points, and hope for the best. About 1/3 of the tags allocated by the state are awarded to landowners with the other 2/3 of the tags going to hunters. While the Cornhusker State's elk herd is a drop in the numerical bucket compared to other states further west, the quality of bulls taken can be very good for Nebraska residents fortunate enough to draw a tag. How good are those bulls? The top typical American elk listed in the 13th edition of the Boone and Crockett Club's Records of North American Big Game is a Sioux County 6x7 bull that was taken by Robert L. Marsteller in 2004. That bull, which ranks 144th in the B&C book, has a gross score of 399 1/8 inches and a net score of 390 3/8 inches. On the non-typical side, the top B&C American bull elk from the Cornhusker State is a 7x10 wapiti taken in 2008 by Dana L. Foster. That Garden County bull, which has a gross score of 424 7/8 inches and a net score of 409 7/8 inches, ranks 56th in the B&C rankings. What about Cornhusker State bulls in the archery ranks? 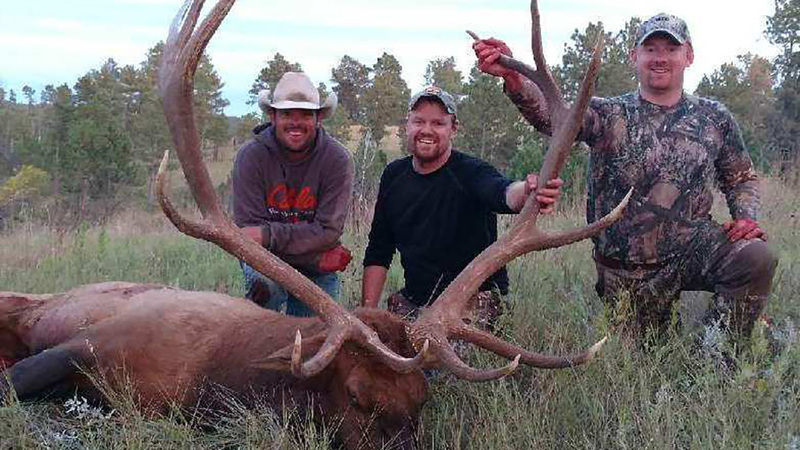 According to the Pope and Young Club, a total of eight American elk from Nebraska – all typicals, by the way – have been entered in the bowhunting record keeping system. 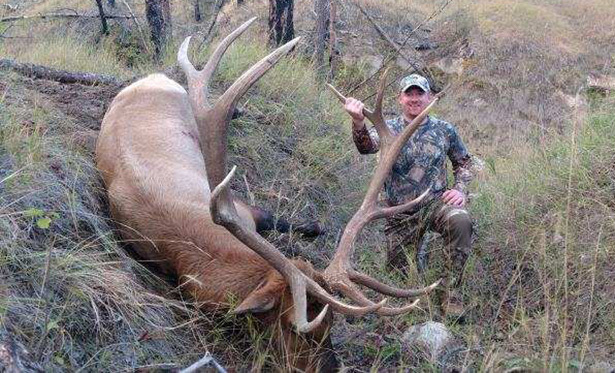 The top American elk entry from Nebraska is a 6x6 bull from Banner County taken by archer Doug Correll in 2014, a bull that net scores 362 7/8 inches and ranks #410 in the P&Y book. Interestingly enough, of the eight Nebraska elk entries in the P&Y record keeping system, five of those have come since the year 2011. As the companion story to this piece shows, that list may grow by another entry thanks to Kearney, Nebraska, bowhunter John Rickard's recent big 6x6 bull elk. Taken near Chadron with a bow on Sept. 16, 2017, Rickard's bull has been taped out by an official P&Y measurer and given a green gross score of 366 7/8 inches and a green net score of 362 0/8 inches. Following completion of the mandatory 60-day drying period that the Pope and Young Club requires, the bull will receive a final official net score in November 2017. If that eventual number proves to be slightly higher than the green score currently is, it's possible Rickard's bull could become the new benchmark typical wapiti in Nebraska. "I think that it's a pretty cool thing that the state of Nebraska opens it up and allows residents to hunt elk here," said Rickard. "Up where I hunted near Chadron, there are pretty good numbers of elk up there." As he waits on the final score of his bull elk, Rickard also will be waiting to see what the bull's age is as well as some DNA information gleaned from the bull by Nebraska Game and Parks Commission biologists. "The state of Nebraska actually pulls two front teeth from the elk to age it and they take a portion of the tongue to get some DNA information as well," said the hunter. "I guess they want to see if they are coming from nearby states like Colorado and Wyoming, or were they born and raised entirely in Nebraska." Whatever the final information shows in terms of score, age and DNA, Rickard says that he's very grateful to have drawn his once-in-a-lifetime tag, as well as being able to punch that tag and make good on his opportunity to fill the freezer full of succulent meat and to tag one of the largest bulls ever harvested by a hunter in the Cornhusker State. "It was a once-in-a-lifetime tag and it was a once-in-a-lifetime bull," said Rickard. "I guess I couldn't have asked for a better scenario."